Highlighters were something that I used to avoid at all cost. I think it's because I have combination skin and the thought of adding any more shine to my already shiny face was a bit terrifying. That was before I discovered the power of Revlon's Colourstay foundation, and now I have no worries about looking crazy shiny at all. Because of this, I've been experimenting a lot with highlighters, particularly the Ice Queen shade for the NYX highlight & contour pro palette. I fell head over heels with the results that it gave me, so I decided to branch out and buy their jaw-droppingly beautiful Strobe of Genius palette. This is a palette that is dedicated solely to highlighter, with colours to cater to all skin tones. Of course, not all of them will suit my fairly pale, yellow-toned skin, but I can see myself using many for other things. As with pretty much all NYX palettes, the packaging is a pretty solid plastic, featuring a black base and a clear lid that click locks. It's fairly slimline and not too big, so it could be ideal for travelling. You get 7 shades in this palette, which is absolutely amazing considering the price (£15 from Boots). 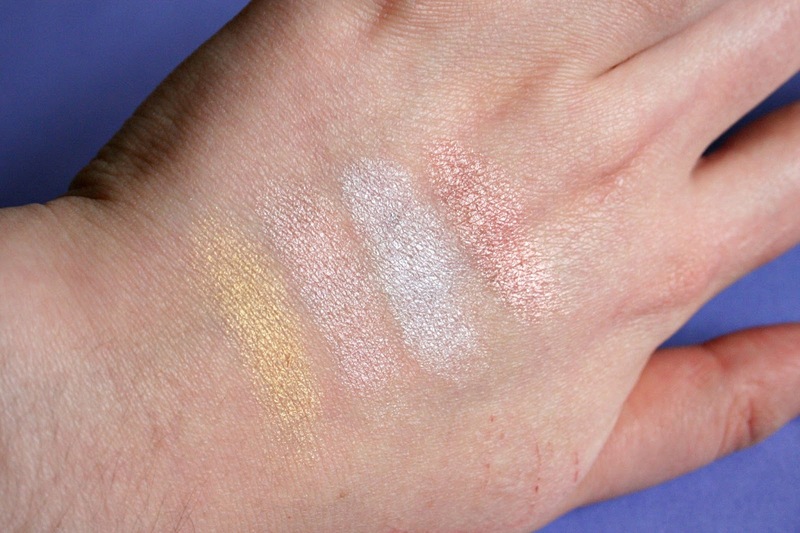 There are four more 'unusual' shades in smaller pans along the top, with three larger shades along the bottom, which could be perfect for contouring. Let's take a little look at those colours up close, shall we? This is the top row of the palette, with the first shade being a really sparkly gold. I was a little disappointed with the pigmentation of this shade, and I found it a bit patchy when I applied it. This being said, I don't think I ever want solid gold cheekbones, so a more faint colour but super sparkly base is ok. I think it would look so so good on a darker skin tone for a summer glow. Next up is a gorgeous champagne shade with a strong, pink undertone. 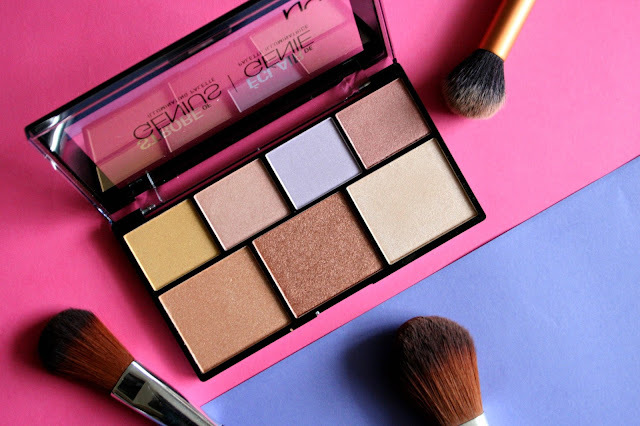 This one is just stunning, and it's ideal for highlighting as well as adding a little blush to your cheeks. The third shade was something that I was quite scared of initially. In the pan, it looks like a pure, cool-toned lavender, but when swatched it's actually an icy lilac. Purples are designed to brighten, so this will be amazing at creating a dramatic sculpted look, as well as brightening up those inner eye corners and under the brow bone. 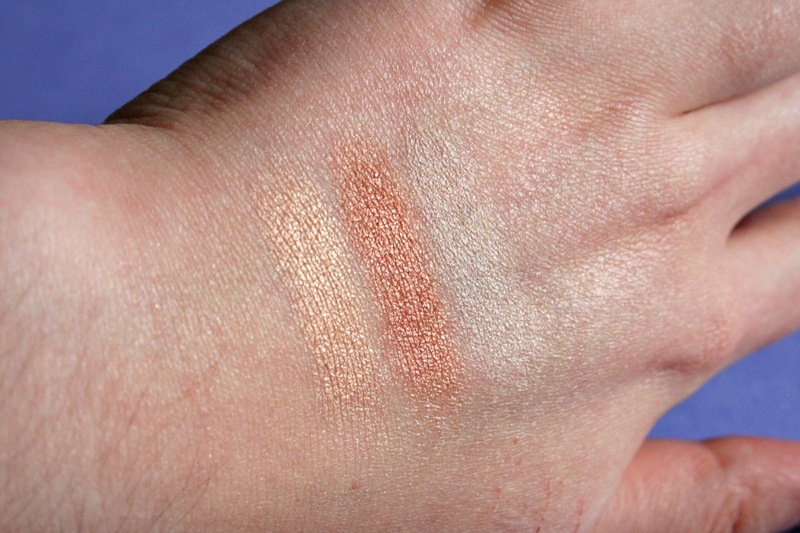 And lastly, we have a fabulous rose gold, which is my favourite of the whole palette. I can see myself wearing this a lot as an eyeshadow, but I think it would look amazing on people with more pink-toned complexions. On to the second row, with that first warm, light gold shade. I find that the application of this gold was a lot better than the gold in the first row, and I actually love how much more warm this one is. Although, again, I think this would suit a darker complexion more than it would suit mine. However, I think it would also make a great eyeshadow, so it will definitely be getting used. Next up is a stunning bronze with a slight reddish undertone, which is my second favourite shade! This would look great as a contour shade, to carve out those cheekbones while adding a beautiful glow. It would also be the ideal highlighter for deeper skin tones. Last of all, we've got a true champagne, and this is the shade that I found the most disappointing. I'd seen a lot of other swatches where this shade had been so so gorgeous and opaque, but I just couldn't seem to get much from it. I will keep trying to work with it, though, as it's such a pretty colour in the pan. EDIT: that last champagne colours is actually amazing for adding a really subtle, natural glow, and I've found myself using it a heck of a lot! I was definitely too quick to judge. As you can see, almost all of the shades are really pigmented and opaque. Each of them are finely milled so you don't need to worry about chunky bits of glitter on your face. There were only a couple that I found a bit iffy, but that I loved the rest of the palette! Despite the disappointments, each of the shades were super velvety to the touch, and they actually blended out really well. A little definitely goes a long way, so if you're about a natural glow like me, you only need a tiny amount. But if you're all about those dramatic, chiselled cheeks, you can slather this stuff on and blind anyone that looks your way. It's such a versatile palette, and as I've said, I can see myself using many of the colours as eyeshadows instead of highlighters. Although, at £15 this palette is a little pricier in comparison to many other drugstore palettes, it really is worth the money. Do you own this palette? What do you think of it?